The inter vertebral disc lie between successive vertebral bodies from the second cervical vertebra downwards. They are composed of fibrocartilege. The outer portion of the disc is composed chiefly of concentric rings of fibrous tissue, the annulus fibrosus. The central portion of the disc is softer, gelatinous, homogenous and elastic. It is called the nucleus pulposus. The physiological changes and the mechanism of disc prolapse have already been discussed. Please refer "How Back Pain Works?" 'Herniation' by definition is a ' rupture, a protrusion of all or part of an organ through a tear or other abnormal openings in the wall of the containing cavity.' By ' herniation of a disc' means that the material herniating is the nuclear material that has herniated through the confines of the annular cavity. The process of herniation occurs in varying degrees and in varying sites. The torn annular fibers allow the nuclear materials to emerge from within its annular container into one of the canals. This is considered as a true herniation. This is a 'ruptured discs'. The disc prolapse and its herniation occurs when a person unexpectedly and carelessly bends forward and simultaneously turns to one side. When an improper action is carried out in an inappropriate manner without the patient consciously doing it, the muscles and the ligaments of the functional unit are 'caught unaware', causing injury to the disc. This injury can also occur when he returns to the erect position with an improper simultaneous twisting. This movement can disrupt the inner annular fibers as well as the outer annular fibers. A pathological condition in which the nuclear material herniates out through the inner and outer annular fibers, with or without nerve entrapment, is called 'a ruptured disc' or 'a herniated disc'. Extrusion of the nucleus through a central annular tear presses against the posterior longitudinal ligament. This posterior longitudinal ligament is innervated and sensitive. Hence causes pain. 1.Pain felt in the low back area. May also felt at non specific areas and the gluteal region. 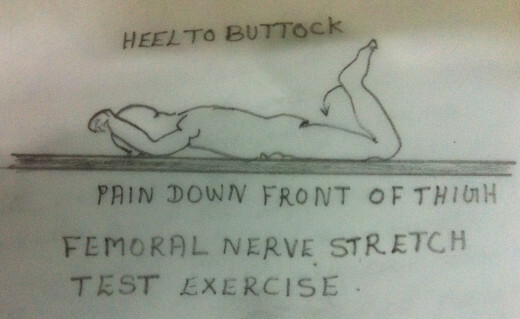 2.The low back becomes 'splinted' and it assumes a particular position to relieve pain. 3.Spinal flexion, in either bending forward or sitting, is limited. This is because this position causes further posterior extrusion of the nucleus with a posterior bulge. 4. Straight Leg Raising Test (SLR)- is positive. But this test is positive because of muscular cause and not of neurological cause. Any pain felt down the back of the leg while doing SLR is because of the stretch of the tight hamstring muscles. 6. X - ray - Normal. But show a straightening of the lumbar lordosis. 7. CT scan / MRI - May show a central bulge of the disc. 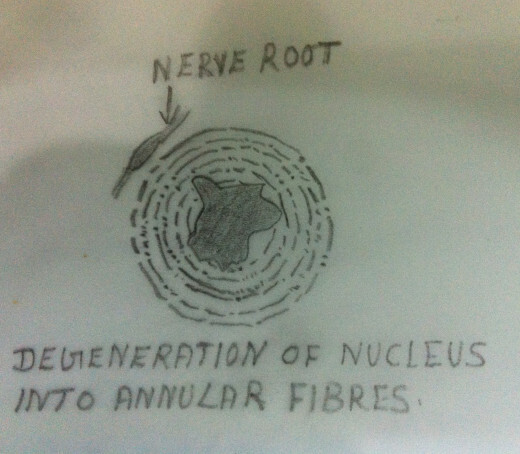 But nerve roots are not displaced or invaginated. 8. Myelogram, CT scan with dye or MRI may reveal the presence of a fragment and its location. 1. Oral Non Steroid Anti inflammatory Drugs, to reduce inflammation and to reduce muscle spasm. 2. 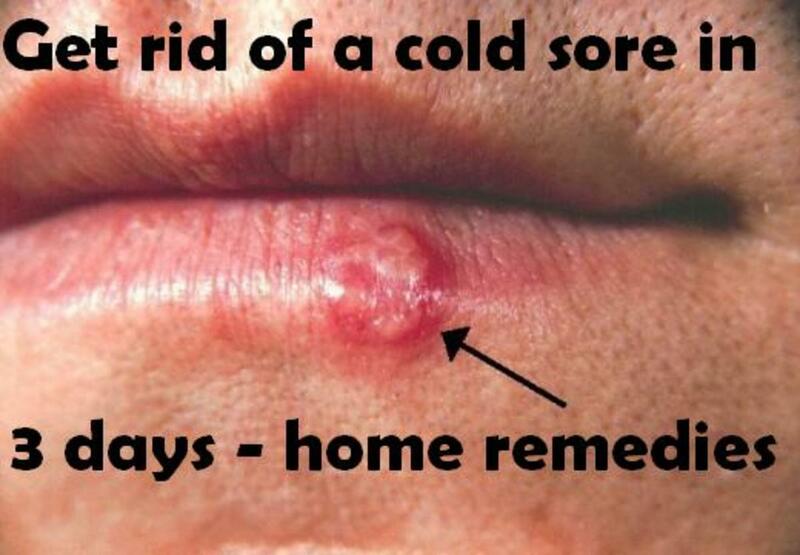 Oral Steroids to reduce inflammation and muscle spasm. 3. Epidural Steroid Injection, if there is persistence or intensification of low back pain. 4. Spinal Extension Exercises must be avoided - It can entrap or further protrude the nuclear fragmentation. 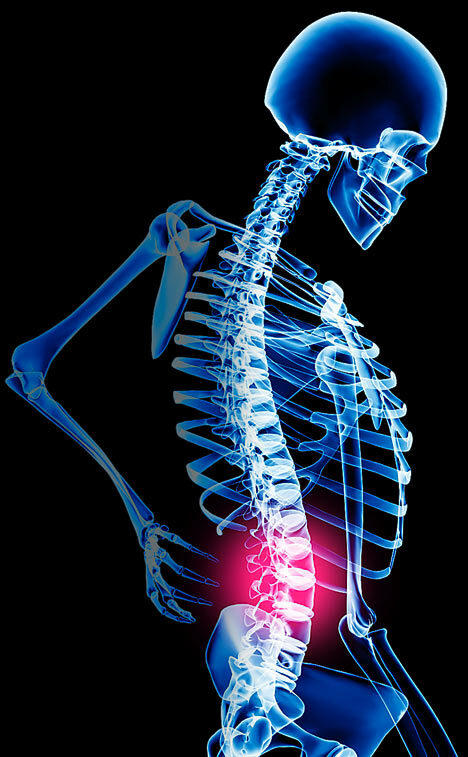 Spinal Flexion Exercise may also be avoided. 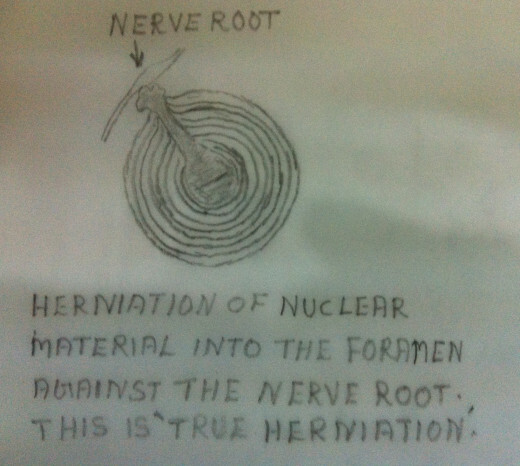 An excessive flexion exercise can herniate more nucleus. 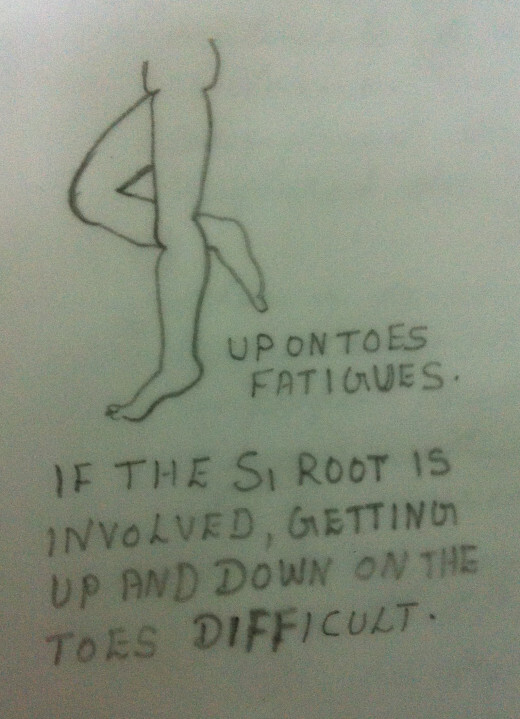 In short, no exercise is advisable till the pain subsides. Rest in a comfortable reclining position is preferred. No weight bearing except for the bathroom privileges until the symptoms subside. 5. During the acute stage application of ice is preferred to heat. 6. Cryotherapy is continued till the acute stage subsides.Then Heat Therapy is advisable. 7. Once the pain has subsided, a thorough evaluation is done and physiotherapy management is planned. Suitable exercise program may be given and advised. Refer " How to Take Care of Your Back ?" 8.Corset to immobilize the spine is advisable when the patient becomes ambulant. A corset may minimize the movement of the spine, the flexion and extension, during healing. It permits early ambulation. The purpose of immobilization of the spine is to prevent further potential herniation and migration of the extruded fragment laterally and encroach upon the nerve root. 9.Manipulation is contraindicated as it may lead to further fragmentation of the extruded nucleus and cause damage to the longitudinal ligament. Posterior or posterolateral Extrusion of a nuclear herniation through a rent in the posterior longitudinal ligament may encroach on a passing nerve root. This is a major complication. Nerve damage is the result of a disc herniation. Hence proper recognition and proper treatment of 'disc herniation' is very essential. 1.Pain in the low back usually in the lumbar region - may be non specific - the pain is due to the disc herniation into a foramen or in to the spinal canal. 2.Pain, Hypalgesia and / or Paresthesia felt down the distribution of the particular nerve root.The patient may also have the feeling of 'numbness' down the dermatome of the nerve root. 3.Weakness of a Specific Myotome - A Myotome is the medical term used to denote the muscle group innervated by a specific nerve root. As most of the muscles are innervated by more than one nerve root , it is difficult to find out,'which nerve root is involved?'. 4.In testing the integrity of the nerve roots or the peripheral nerves, not only its strength but also its endurance must be evaluated.Endurance (repeated contractions against resistance) is a more effective and dependable test for an intact innervation than merely testing the strength of the muscle by one or two contractions against resistance. 5.Test for tenderness of the muscle innervated by a specific myotome or a specific dermatome will also reveal impairment. 6.Limited Trunk Flexion - When a person, suspected of having disc herniation, attempts to bend forward there is significant reversal of lumbar lordosis and no acquiring of lumbar khyphosis.But lumbar flexion occurs because of the rotation of the pelvis about the hips. 7.A Functional 'Scoliosis' may exist - The term functional 'Scoliosis'implies that the scoliosis is transient and not from structural vertebral changes. If the nerve root is under pressure from a medial nuclear bulge, the nerve root will move laterally. 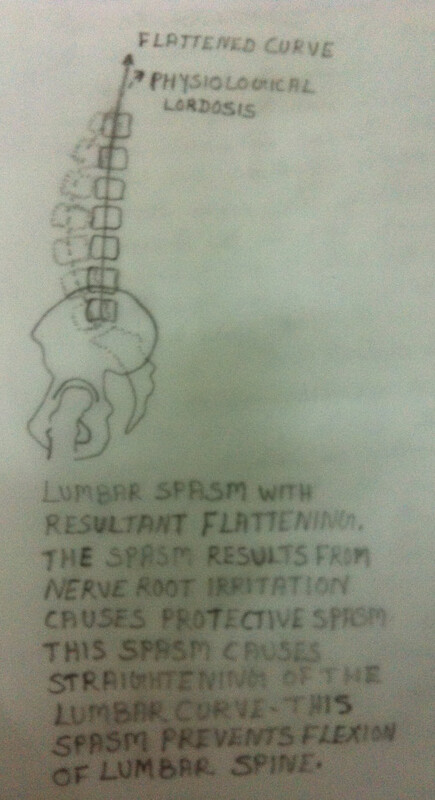 Irritation of the nerve root at its emergence through the intervertebral foramina causes reflex spasm of the Erector Spinae Muscles,usually on the same side of irritation. Because of the segmental distribution, only a small portion of the Erector Spinae Muscles is involved.Hence a segmental lateral curve of the spine results. Hence the 'Scoliosis'. 8.Straight Leg Raising Test - SLR positive with the positive dural sign must exist if diagnosis of the nerve root infringement is to be entertained. The pain response during the SLR may be due to the stretching of the tight Hamstring Muscles and not because of the stretch of the Sciatic nerve root.Since the nerve root is not sensitive, the pain elicited during SLR may also be because of the stretching of the inflamed dura. Hence for the SLR to be considered positive, the dura of that nerve root must also be involved. In short, for a positive SLR test to be a positive neurological test,it must also have a 'positive dural sign'. In order to carry out the dural stretch test, the flexion of the neck and the dorsiflexion of the foot must also be incorporated in the SLR. Without the positive dural component, the SLR test cannot be considered positive. 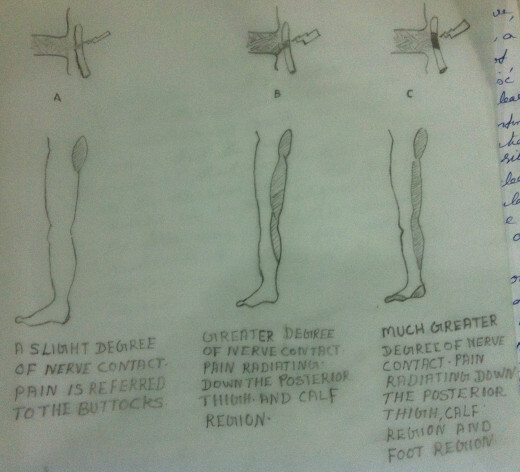 SLR Tests, tests the integrity of the Sciatic Nerve (L4 - 5,to S1). 9.Test for the Integrity of the Femoral Nerve - A similar test may be performed for higher root levels (L2 - L3) which go down the anterior part of the leg, the Femoral Nerve. To stretch the Femoral Nerve, the patient is positioned in prone and the foot is gently brought to the buttocks by flexing the knee. This activity stretches the front of the thigh (the Quadriceps Muscle) and the Femoral Nerve. While performing and interpreting the test, the stretch attained in the normal leg must be compared with that of the abnormal leg. Care should be taken to differentiate the muscular stretch pain from the nerve stretch pain. 10.The positive neurological signs may be elicited implicating a specific nerve root and thus a specific disc level. 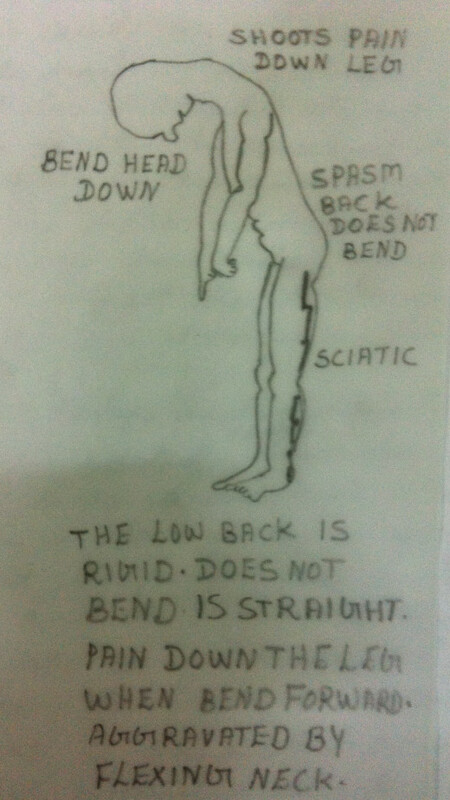 Same as in the case of treatment for 'Disc Herniation Without Nerve Root Entrapment'. Please Refer 'How Back Pain Works? Part 2'. So these were some tips on how to prevent or reduce back pain with some trivial changes in how you lift and sleep. To see tips on how stand and sit, click here.